Candidate Reviews – Nadine Bocelli & Company, Inc. – New York Legal Staffing, Inc.
Nadine Bocelli & Company, Inc. – New York Legal Staffing, Inc., provides the highest level of service and support to our candidates. We are more concerned with your happiness in your position than our bottom line. It is our primary goal to find you not only a great job, but one you will be satisfied with for years to come. We focus on building your career, not just finding you a job. 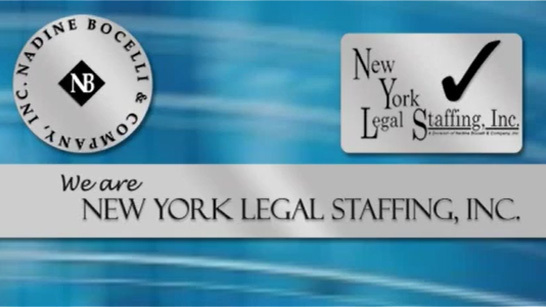 Nadine Bocelli & Company, Inc. – New York Legal Staffing, Inc. receives online reviews, ratings, e-mail and thank you cards from our candidates expressing their gratitude for the level of service we provided to them during their job search. We would like to share some of these with you. Eager to switch jobs, I applied to a listing I found online with Nadine Bocelli & Company. I received a response the next day and scheduled an interview with them for the following week. I met with their team, specifically, Jennifer Walnick, who was incredibly helpful and communicative. She eagerly answered all of my questions, gave me useful job interview tips, and arranged one for me just a couple of days later. The interview went well, and Jennifer completely led the way, following up on my behalf on all of my additional inquiries about the position. I received an offer and accepted. Job hunting is often an arduous and unpleasant process, but thanks to Jennifer, this was the first time that I was able to find the right job in a short period of time. It took only ten days from the day I began my job search to find the position that suited me best. I owe the ease and celerity of this process to Jennifer because she not only guided me through the steps, but her kind and attentive personality made it all seem that much more effortless. I am so grateful for her assistance, and I one hundred percent recommend the services at Nadine Bocelli & Company. 11/03/2017: Got a job through them within four weeks of having my resume reviewed in person. I was working with three legal staffing firms, and this one was by far the most effective and responsive. Nadine Bocelli and Jen Walnick were personally in touch via email, phone, and text message multiple times per week with updates and potential job opportunities. They responded to emails and messages within minutes, and they respected my autonomy, goals, and those of their clients – highly recommend them. 8/17/2017: I have worked with other recruiting firms in New York City, and this is by far the best. I had a job offer with a great firm in less than 24 hours of walking into Nadine Bocelli & Co. They were very quick to respond to any questions or concerns, very friendly, and made the job searching process a breeze. I highly recommend them! 4/20/2017: This is a very professional firm. If you are re-entering the workforce after a break or continuing with education, they are most helpful. They gave wonderful insight as to what the job market is like and what employers are actually looking for. Very timely and answered your concerns very honestly, and provided very good advice on what to include on your resume. Jennifer Walnick is an asset to anyone on the job hunt, she is personable and professional. I highly recommend this company! 12/9/2016: One of the best recruiting firms in New York CIty. Jennifer Walnick is passionate about helping people advance their careers in the legal industry. NYLS is not only incredibly professional but they really look out for you and your interests. They help candidates in all areas, from touching up resumes to connecting them with jobs that they will actually enjoy doing. Jennifer personally saved me from slaving away at a job I would have hated and found me an amazing job at a great law firm in lower manhattan that I love. If you just graduated from college or you are a seasoned professional in the industry, NYLS and their staff will be on your side to get you where you want to be. Not to mention they help reduce A LOT of the stress that can come with searching for a job. 10/10 every time. I worked with Jennifer Walnick at Nadine Bocelli & Co. and have since been placed as a paralegal at a top litigation firm in Manhattan. She helped me get the exact position I was looking for: in line with my career aspirations and future plans to go to law school. I’m giving both Jennifer & the agency five stars because they met ME as a candidate, rather than as a resume & bonus, and connected me with an employer that matches my ambition. Jennifer is down to earth and responsive, as well as knowledgeable about the field and the territory in Manhattan. The interview she arranged for me was strategic and well-conceived; such that I ended up getting an offer far above what I was expecting. I had been working with other, older recruiting agencies and kept getting no’s after all my interviews. When I sat down with Jennifer, I didn’t feel so beat down–I felt motivated–not an easy task for a recruiter to pass along to their candidates. I highly recommend Nadine Bocelli & Co. if you are looking to make an impression in the legal field, and land a job you really, really want. Ask for Jennifer! She stood by me the whole way. I am giving this staffing agency the 5 stars! They helped me a lot in the 4+months I was in between jobs. During those months I had moments of great discouragement and frustration. They never let me down and continued working on my case until I successfully landed a job. My recruiter was Jennifer Walnick who assisted me closely on a very personal level. Looks like I needed a little TLC on top of a recruiter with great professional skills and she was able to convey it! My new employer is everything I asked for in my initial meeting with the agency and I couldn’t be happier. I highly recommend Nadine & Bocelli! Amazing people and amazing support! I started working with Nadine Bocelli & Company about two weeks ago and I have already been placed. Before working with the agency, I’d spent nearly three months unsuccessfully looking for an entry level paralegal position on my own. After I submitted my resume online I received an email a day or so later, and two days after that I was in the office for an in person interview with Jennifer, one of their recruiting representatives. Now for the reason for my review, Jennifer. She has been incredible throughout this entire process. From the initial meeting, to any follow up questions, to my placement at a law firm. She’s responded to all of my emails promptly and provided me with guidance on all of my questions. Most incredibly, when I was placed (which occurred on a weekend) she emailed me, called me to confirm I had received her message, sounded just as excited as I did, and then after my first day, checked in on me to ensure I was happy with my placement. Going into this process I was not expecting the people that placed me into a position to be this invested not only in my placement and success, but also in my happiness. I’m thankful to the people at Nadine Bocelli & Company, and especially to Jennifer, for how enjoyable they have made what could otherwise have been a very stressful process. 12/7/2016: I was contacted about a potential opportunity by Jennifer Walnick. She was attentive, listened to me, and the opportunity proved to be a great opportunity. I was blessed with an offer from the interview Jennifer set up, which I mulled over for several reasons. I ultimately decided that there were better positions for myself. During this process, Jennifer was there talking to me candidly, evaluating the pros and cons of the opportunity, and listening to my thoughts. She put my needs ahead of her placement, which was very important to me. That honesty and selflessness allowed me to fully evaluate the job, and actually made me more likely to take the position. Having that kind of support is invaluable. Being able to trust the recruiter you work with is vital. I would highly recommend Jennifer based upon my experience, and I have no reason to expect any less from any member of Nadine Bocelli. I never leave reviews, but here goes, because this place is worth it. I was post-college graduation and enduring the job hunt. Months spent on indeed.com, monster, applying directly, you name it. I was looking for the right paralegal position, a job in which i could thrive, not just be fetching coffee and putting my time in. I’m working at a law firm before law school in order to see if its really what I want to do with my life, and to save money. Immediately- I mean within days of our introductory interview, they were sending me out to paralegal interviews at high level firms in NYC. It was amazing. Honestly, this is the way the professional job market works these days, you need someone who will get your foot in the door. Understand how magic that is for a 22 year old straight out of college. Eilis was great, she worked hard for me and got the job done. For that I am extremely grateful. It took me 2 Weeks after using Nadine Bocelli to receive an offer from my dream paralegal job. I worked extremely hard there and received the permanent offer. 4 months later, I’ve saved enough money to get my own apartment in NYC, and I couldn’t be happier with my job. I owe a lot to Nadine Bocelli. I am completely independent from them, I have no link to this organization, my judgment is completely unbiased. Joining them propelled my life forward, I HIGHLY recommend that you do the same. I would say the same to anyone. Good luck! I found Nadine Bocelli & Company when I applied to a job posting online (probably ZipRecruiter, not sure). As others have said, they are very personable, easy to communicate with, and have a good reputation. My current assignment will end shortly, and am looking for jobs with the help of Jennifer Walnick who has been very helpful, and is always quick to respond. They do have a screening process, and will ask you to take a software test, but if you are a millennial or are used to using computers on a regular basis, you will probably already know everything on the test. If there is anything you don’t know, it is very simple to learn and will probably be useful knowledge to have for work anyway. They actually care about you and the recruiters are personable. Smaller recruiting firms MIGHT net different opportunities than huge ones, but one area that you really DO see a difference is in customer service and support. I would 100% recommend to whoever is seeking a job in law. I have been registered with Nadine Bocelli & Company for a very long time. I like the personal service I have received with them. Being they are a small recruiting service, I feel that I get the attention on a personal level and not just another number on the list like other places. I have currently been working with Jennifer Walnick who has been very helpful during my job search and have landed a long term assignment due to her help! Thanks and hands up to Nadine Bocelli & Company. They are really great. They go the extra mile to help you out as much as they can. Even if they have any tips or recommendations. Absolutely recommend. I had a fantastic experience with Nadine Bocelli & Company. The recruiter I worked with (Jennifer) was pretty much my personal therapist throughout the whole experience. She was incredibly responsive and helped me thru every single step. While of course it was frustrating to have to wait to hear from companies I was interviewing with, Jennifer did everything and then some to follow up and get answers. I started my new job in NYC mid October and Jenifer and I still keep in touch to this day. The experience with a recruiter truly is what you make of it, regardless of who you use. I was lucky I had one of the best on my side the whole time! Thanks Jennifer! I was contacted by Nadine Bocelli’s Staffing Company for a position in my field. I worked with Heather, who is very responsive and kept me well informed throughout the hiring process. I definitely recommend their services to anyone looking for a new job. I have been dealing with Nadine Bocelli & Co for years! They are a highly respected legal staffing agency that I would recommend to anyone and everyone. If you have the skills and the professionalism, they will definitely find you a “home” just like they did for me. I had been working in Manhattan for over 15 years. At one point, I decided to stop working in Manhattan and get a job close to home. Worst mistake ever! When I was trying to get back into the legal field in Manhattan, I reached out to Nadine Bocelli and it was the best thing I did! I now have a job I love and that loves me!! Thank you, Nadine! You and your staff are the best!! People often say that recruiters look out more for themselves than their clients, but I can honestly say that Nadine Bocelli & Co does not fit that description. I had a fantastic experience with the whole team, and I think people should know that there are some truly great recruiters out there. I worked primarily with Heather, but everyone from Nadine and Sereno to the receptionist genuinely did their best to make the job hunt seem so easy. Clearly they understand that this process can be stressful, and they care enough to do everything possible to make it less so. They matched me with interviews at great firms, and provided advice along the way to help me succeed. They reviewed all letters I wrote and gave tips on how to make them better. They literally updated me daily on the entire hiring process. Even when they were not in the office, they made themselves available in case I had questions. In the end, I found a great job at a new firm and I couldn’t be more excited, all thanks to Nadine Bocelli & Co.
I’ve worked with Nadine Bocelli & Company twice. The first time, I was much younger and I did not have very much office experience at all. They had a tougher time finding me something but that may have been my lack of experience at the time and also perhaps the state of the job market. Years later after I completed a paralegal associate’s degree, they were able to find me something less than one month out of school that suited my skill set very well. In both occasions I worked with Libby and I LOVE HER!!!! She genuinely wants to help find you what will work best for you and she is so pleasant to work with. I’ve been at this firm for over a year now. Thanks Bocelli! Nadine Bocelli & Co. were a wonderful resource for me. They sent me out on several temp jobs that were a godsend while I was unemployed. Then, when a job unrelated to their agency fell through and I was very worried about what I would do next, they hired me as their Administrative Assistant while they searched for full-time work for me. I learned a lot while there, and it was great to have them on my resume while I searched for work. They ultimately ended up placing me as a paralegal at an IP Firm, and it has been going really well so far. I went in for an interview and was offered the job the next day. Having an insider and an outsider perspective, I would definitely recommend them if you have any office experience at all and are looking to get into the legal field. I would also recommend using them if you are a recent grad with an internship or an on campus job under your belt. Also obviously recommended if you are an experienced Paralegal, Legal Sec, Attorney, Docketing Clerk etc. If they don’t find you something immediately, it does not mean that they are not looking. The second that something comes in that matches your qualifications, they will get in contact with you to see if you’re interested. I don’t know what all these other posts are about but Nadine is the BEST. She’s placed me in two different firms over 5 years and even calls to check in and see how everything is going. She is thoughtful, kind, and responds to emails almost immediately. I cannot say enough about her professionalism and grace. I couldn’t recommend her more! My personal experience with Nadine Bocelli & Company, Inc. has been very positive. It’s a small office, the staff is very friendly and Serrano, Libby and Nadine give it a personally warm personal touch. After 7 years of working for a law firm that I loved but dissolved in 2010 I have been to many agencies whose representatives promised to help me find a job but to no avail. Not even a follow-up telephone call. I searched through Craig’s List, other agencies and due to the rough economic times Nothing happened. However, Serrano Bocelli and his staff really cared and was dedicated to help me in my search. I have been working on and off at the same temporary assignment and been very happy. The company I am working for is close to my home, and the working atmosphere is very friendly and professional. Currently working as a legal secretary for a loyal client of Nadine Bocelli & Company and loving it. Also a big plus for them is that I have been to a few agencies who hire for temp. positions but Nadine Bocelli & Company is currently paying a higher hourly salary! Hoping my assignment continues for a long time to come! Thank you Serrano, Libby and Nadine for all of your help and for the assignment I am currently working at! Nadine Bocelli & Company, Inc. brings a warm, friendly and down to earth approach to the sometimes tooth pulling sensation of the job search process in today’s economy. My experience with this agency is that they are honest and will hang in there for you until you find the best fit for your skills and personality, unlike so many other agencies out there that are only concerned about making a placement. Their roster of loyal clients spans corporate-size to single practitioners, with practices you seriously have to try to believe! Oh, I also had fun working with them and will miss them now that I found a job ! Best of luck in your search! I’m dealing with Libby right now, and she is excellent, regardless of whether I get this job or not. She knows what she’s talking about, studies the industry and is an absolute pleasure to work with. And, wow. Would you believe it? She FOLLOWS UP! She actually keeps you apprised of what is going on! I am in awe! Also, she’s a nice lady and is fun to chat with. I definitely did not go to an Ivy League college. I transferred to a private college… And then it was voted the worst school in America. Twice. I wrote a convincing cover letter when contacting Bocelli. Serrano went above and beyond to help me find a job. I ended up magically finding a great position via Craigslist, but Serrano Bocelli worked with me to make sure I was interview-ready. On that note, I’m sending him a card. Hunting in the job market during a time real jobs simply weren’t available, Nadine Bocelli & Co. contacted me based on an outdated resume from even before law school, and placed me as in-house counsel to a great company. They worked with me on several issues, and achieved rapid results. It took 4 merely 4 days to permanently place me, and I have been with the company for well over a year now. When I started looking for a job, I was referred to many employment agencies by a friend. Every agency I went to promised results, however, also said it would take a while to find a perm position (which was fine considering the job market). After just a couple of weeks Nadine Bocelli & Company sent me out on a temp job. Also, let me add I did not get one call from ANY of the 7 or so other agencies I went to. Then a couple weeks after that another temp job and with their help and guidance became perm within 3 weeks. I love my new job and am so happy to have been able to work with Nadine Bocelli & Company! Everyone is very nice and answers any questions and concerns you may have. Thank you so much! Job hunting in an unstable economy has its challenges but the minute I contacted the Nadine Bocelli team, I knew that good old fashion principles of human behavior still apply. Whether it’s a full time position you are seeking or a day-to-day engagement, Nadine Bocelli are leaders in helping you market your skills and achieve success. Nadine Bocelli has a well-established system which calls for concrete action and results. Thank you for your wonderful service, I am so excited about my new position!! You guys Rock!!! I don’t know why this agency has received such low ratings. My experience was great. I found a job with them very quickly and I received constant feedback from Nadine. They’ve been doing this for many years and have tons of connections within the New York legal community. Give them a try! I signed up with a couple other employment agencies during my job search and this by far was the best! Everyone at Nadine Bocelli & Company, Inc. was exceptionally helpful, and I had a wonderful experiencing working with all of them. Almost immediately after applying for a posting online, I received an email from Nadine Bocelli & Co. offering me an interview. I was told that I would first be meeting with Libby. When Libby displayed amazing flexibility in working with me to schedule the interview, I knew this staffing agency was unique. She accommodated my schedule and arranged our meeting in the morning before work. At the interview, she listened to what I was looking for in my next position and seemed to really care about what I wanted. After speaking with Libby, I met with Sereno Bocelli who kept our meeting short because he remembered that I had to get to my job, a gesture I really appreciated. After some post-interview correspondence, I didn’t hear from them again for a week or so. I was worried, but I now realize it was because they didn’t want to send me out on interviews for positions that would not a good fit for me. When they did have an interview lined up, it was for a great job. It was obvious that Libby had really heard what I said in the interview. The position was a perfect match for me, and both Libby and Nadine helped me prepare for my interviews. Just three weeks into my job hunt, I was made an offer for a position that was everything I wanted and more. I would definitely recommend using Nadine Bocelli & Company. I had an excellent experience with Nadine Bocelli & Company. In these tough economic times, the company was able to set up an interview for me within a week of contacting them. They were very professional, helpful and understanding. Sure enough I ended up getting the job!!!! Wonderful people, wonderful service. I’m now happily employed after 6 months of searching. They found me two interviews within the same week, the second of which was for the job I’m currently employed in. Nadine, Sereno and Aileen all worked extremely hard to give me any advice or support I needed and even went as far as speaking with me on their days off. From pre-interview to closing the deal, their follow through is amazing. I have no hesitation in recommending others to put their faith in Nadine Bocelli and Co. in times like these.